I came across this article recently positing an invasion of the United States by the Nazis during World War II. It immediately brought to mind two games from my wargaming past – RISK and Axis & Allies (and Invasion America, though I never actually played that one). I got RISK as a kid and immediately fell in love with it – one of those “I didn’t know something like this even existed!” moments. I was big into militaria and WW2 as a kid – watching Victory at Sea on Sunday mornings on the local TV station (KVVU, Channel 5) and playing war with other kids in the neigborhood. I remember my first game was played against a friend in the neighborhood and my dad. I played the blue army, naturally, and my father the red army. When he finally beat me, I felt like I’d failed the USA and let the Soviets conquer the world – what a lousy feeling. Fortunately, he gave me some pointers – mostly on not spreading myself thin and attacking at all costs – and I improved quite a bit at RISK. I now move at a snails pace, building up so much depth that attacks crash against me like waves on a shore. The last time I played was a few years ago, with my daughter. The first game I played with her she couldn’t roll a bad dice and she won. She decided RISK was a great game. The next two went to me and she decided she was going to take a break from RISK for a while. C’est la vie. 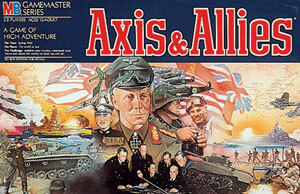 I was introduced to AXIS AND ALLIES (one of the greatest game covers ever, by the way) by some guys I worked with at a video store (VIDEO PARK – World’s Largest Video Store). They also introduced me to SUPREMACY. Fun stuff. I learned the hard way that AXIS AND ALLIES is designed to replicate the strategies used in WW2 – almost like wargame railroading. You wander too far off the reservation, and things can get tough. I can still remember a good friend of mine and I were going to be playing the Axis in a game and we spent the entire day at work plotting our strategy. We seized on the idea of Germany building an aircraft carrier and threatening the USA with its fighters – the Allies would never expect it – we would be unstoppable. Unfortunately, we were playing with a guy who didn’t think in terms of military strategy, but rather game strategy – and he also had a knack for rolling dice. Germany built its ill-conceived carrier and, like the real carrier built by the Germans, it took forever, was finally stuck in port, and then unceremoniously sunk when the Allies came across the Channel. Still – good times, and very instructive about the importance of understanding the logic of the game rules over the logic of the “real world”, even in terms of old school, rules-lite games. That's an interesting article, but I'm trying to imagine a scenario in which the Japanese would be willing to commit major elements of their fleet to the Med, and it just isn't coming to me. Fascinating to see what kind of predictions are made with severely incomplete information. Within the gaming circle with which I still play versions of Axis & Allies with some frequency, a German aircraft carrier has become more-or-less standard operating procedure, though more for defensive than for offensive purposes — It's the only way to protect German transports in the Baltic, which are a means of accelerating the otherwise glacial movement of troops to the Eastern Front. Combined with a few U-boats, it also serves as a raiding force that can draw blood from the British navy if it spreads itself too thin. @faoladh — Chalk it up to worst-case-scenario thinking and Allied propaganda. 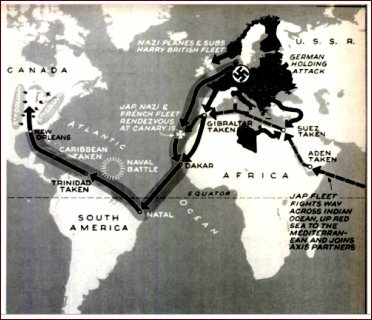 Even after Pearl Harbor, and Germany's declaration of war, there were isolationists who didn't think the US had reason to be involved in Europe — articles like this were meant to drive home the idea that the Axis was a real, coordinated alliance that would soon come knocking if we didn't take the fight to them.